This is a new Surefire AR-15 .223 Aluminum 60rd. Magazine. The SureFire high-capacity magazine for 5.56x45 mm (.223 Remington) ammunition is compatible with M4/M16/AR-15 variants and other firearms that accept standard STANAG 4179 magazines. Constructed from Mil-Spec hard-anodized aluminum, they feed smoothly and reliably due to optimal geometry, non-binding coil springs, and ingenious nesting polymer followers. The long-lasting springs are cadmium coated for low friction and excellent corrosion resistance. Magazines require no lubricants and can be easily disassembled without tools for cleaning. 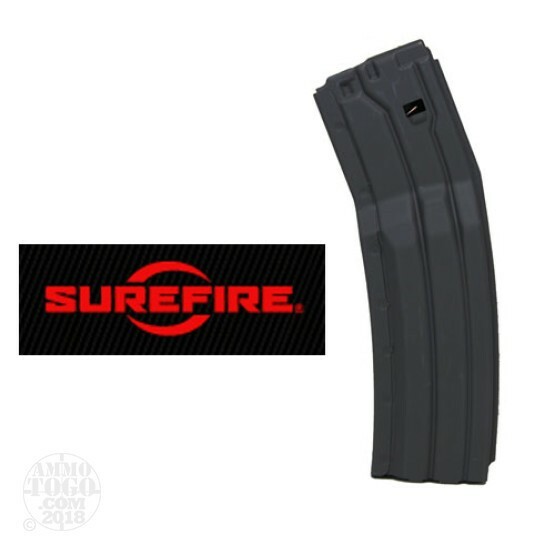 SureFire High capacity magazines provide distinct tactical advantages: increased initial firepower in ambush situations; fewer reloads overall, which means less downtime and target distraction in a firefight; fast and easy magazine insertion, even with a closed bolt; less bulk compared to drum mags, enabling a normal weapon grip. The 60-round magazine - slightly thinner than two 30-round magazines clipped together and about the same overall length - fits in most dual magazine pouches, eliminating special carry pouches required for drum magazines. Works well with PMC 55 grain. Not one problem. Bought 5. All work flawlessly. 3 round bursts. Two and three quarter inch group @ 50 yards. ATG Note: Surefire says that you can paint their magazines, but they do not recommend powder coating, because of heat in the process. Thanks for your question!